Allan Rogers is one of the big names in the peony world. The peony named after him will be of great fame as well. The pure white flowers are already extremely attractive in the bud. They will only become better when they’re opening up. 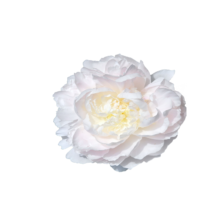 Allan Rogers is a snow-white peony that blooms late in the season. The double flowers are enchantingly attractive and can compete with Madame Claude Tain. The flower is named after the legendary Allan Rogers. She was found in 2008 by Seidl and Wierstra. She is pretty young for a peony, but she is on her way. Make you sure you get ready!